When it rains, it pours...and floods! FM 762 Closure at Crabb River Road On Friday, December 14th beginning at 8:00 pm, FM 762 northbound and southbound will be closed at the BNSF railroad. No traffic will be allowed to traverse the railroad crossing at this time. 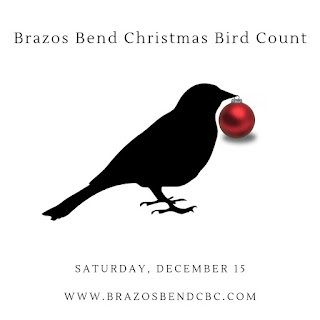 The roadway will reopen on Saturday, December 15th at 10:00 am. This closure is necessary for BNSF to install new planking at the railroad crossing. During this time Webber will also install underground box culverts in this area to minimize the amount of total closures necessary. The detour for FM 762 northbound will be FM 762 to Berdett Rd to A Meyers Rd to Benton Rd and back to FM 762. The detour for FM 2759 southbound traffic will be FM 762 to Benton Rd to A Meyers Rd to Berdett Rd and back to FM 762. Please build in travel time to your schedule!! Team Assignments - If you have not already received your team assignment, please let me know ASAP! Wet Conditions! - While the weather looks good for the Count itself (for a change!) there will be wet areas from the deluges earlier in the week. Additionally, those in Area C3 (Hale Lake with Matt Robinson's group) may be restricted from certain areas due to minor flooding in the park. Please make sure you bring appropriate footwear, and be safe! Registration Closed, One week to Count! The online registration for the Brazos Bend CBC has closed. If you were unable to register, please contact Justin Bower directly at justinbower@gmail.com. If you have already registered, you should receive an email by 12/8/18 informing you of your team assignment. We look forward to seeing you all out there on the 15th! Our Count Dinner is once again sponsored by the NRG WA Parish Generating Station. Our thanks again to our good corporate neighbors NRG for their many years of support for our effort! 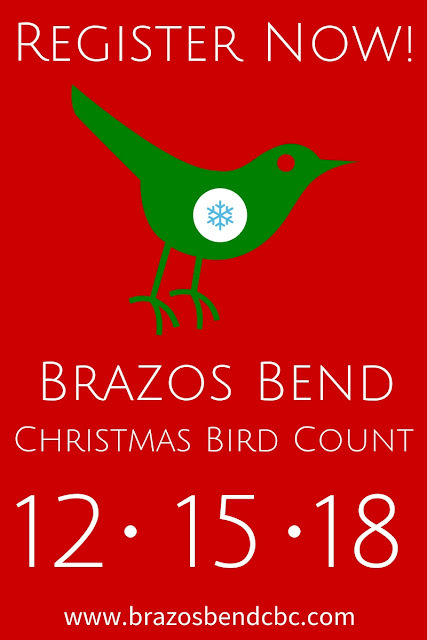 Register for the 2018 Brazos Bend Christmas Bird Count! Save the Date! The 2018 Brazos Bend CBC will be held on Saturday, December 15. Registration is now open, and we hope to see you there!